On Monday, April 9, 2018, Dr. Sharma was featured amongst a panel of Orange County’s respected thought leaders and experts in the Healthcare Roundtable special issue of the Orange County Business Journal (OCBJ), a weekly print and online newspaper for executives and business owners in Orange County. Dr. Sharma was invited to be on the panel of Orange County’s top experts and thought leaders to share his expertise and insights into important healthcare-related issues in 2018. The Healthcare Roundtable covers issues related to policy changes and reform, advances in medicine and technology, emerging value-based care initiatives and other innovative strategies that leading healthcare and behavioral healthcare organizations are utilizing to improve patient care. The panel of thought leaders and experts invited to participate in the Healthcare Roundtable represent local hospitals, community health centers, behavioral health organizations, law firms, academic institutions and insurance agencies. Organizations represented include Sovereign Health, MemorialCare, Kaiser Permanente, UCI Health, Hoag Orthopedic Institute, Cigna, Providence St. Joseph Health, Stanbridge University, Burham Benefits Insurance Services, Monarch HealthCare, KPC Health, Radiant Health Centers and Lindora. As one of the community’s well-known thought leaders in the field, Dr. Sharma shares how Sovereign Health has led the behavioral health industry in adopting value-based care initiatives to increase organizational accountability and compliance. Dr. Sharma also discusses how his organization has adopted a system of measurement-based care to improve the quality and efficacy of care delivered to patients with behavioral health issues. Measurement-based care is now the accepted standard for Joint Commission’s accreditation for behavioral health organizations. Sovereign Health’s implementation of value-based care initiatives has substantially improved the quality and efficacy of care provided to patients with mental and substance use disorders and has consistently led to better treatment outcomes and healthier patients. See the results of independent quarterly reports produced by Harvard Medical School affiliate, McLean Hospital, which substantiate the high quality and efficacious care delivered by Sovereign Health. Dr. Sharma presented at the 32nd annual International Association of Eating Disorders Professionals Foundation (iaedp) Symposium 2018, March 22-25, 2018, Orlando, FL. His presentation, “Which Came First—The (Fried) Chicken or the Serotonin? Eating Disorders, Brain Chemicals and Associated Underlying Mental Health Conditions,” focused on the symptoms and underlying causes of eating disorders as well as the specific neurobiological differences in the brains of individuals with anorexia nervosa, bulimia nervosa and binge eating disorder, which can predispose people to developing an eating disorder. Dr. Sharma was invited to speak at the iaedp Symposium 2018, alongside other behavioral health professionals and eating disorder specialists, including keynote speaker Norman Doidge, M.D., a psychiatrist and psychoanalyst who’s on faculty at the University of Toronto’s Department of Psychiatry and Research Faculty at Colombia University’s Center for Psychoanalytic Training and Research and an author of two New York Times Bestsellers. As one of the biggest conferences of its kind, more than 800 people registered to attend the event. The 2018 symposium offered four days of training, special events and over 70 sessions from leading professionals in the field of eating disorders. In an interview on FOX 31 Denver Colorado’s Best on November 17, 2017, Dr. Sharma discussed how measuring patients’ outcomes can be used to improve addiction and mental health treatment. Dr. Sharma discussed how Sovereign Health has used validated tools to measure patients’ success in treatment and submits data on an ongoing basis to Harvard Medical School affiliate McLean Hospital, which collects and analyzed data using the 24-item Behavior and Symptom Identification Scale (BASIS-24®). “The treatment itself has to be based on evidence,” adds Dr. Sharma. “We do in-house assessments, and based on those assessments, we provide individualized treatment plans.” Independent quarterly reports produced by McLean Hospital demonstrate Sovereign’s treatment effectiveness and better treatment outcomes for patients compared to the national average for addiction and mental health. Watch Dr. Sharma’s interview on FOX 31 Denver to hear what makes Sovereign’s methods different from most other addiction treatment centers. In October 2017, Dr. Sharma was invited to present on, “Using Measurement-Based Care to Enhance Substance Abuse and Mental Health Treatment,” at the 13th Annual NYSAM Conference: Intersection of Science, Treatment and Policy, at the Crowne Plaza Times Square Hotel in New York, NY. As the largest gathering of addiction physicians, clinicians, academicians and other healthcare professionals. who came together to learn about cutting-edge addiction medicine issues, new initiatives and overcoming obstacles to expand access to medication-assisted treatment (MAT), and latest trends in addiction treatment. As a featured speaker, Dr. Sharma was joined by other prominent members in the addiction treatment industry, including Paul Wax, M.D., executive director at the American College of Medical Toxicology and Clinical Professor of Emergency Medicine (Medical Toxicology) at UT Southwestern Medical Center, New York State Office of Alcoholism and Substance Abuse Services (OASES) Commissioner Arlene Gonzalez-Sanchez, M.S., L.M.S.W., and Herbert D. Kleber, M.D., a professor of psychiatry and pioneer in substance abuse research and treatment for over 35 years who founded and headed the Drug Dependence Unit at Yale University, served as the Deputy Director for Demand Reduction at the Office of National Drug Control Policy in the White House, and founded the Division on Substance Abuse at Columbia University. 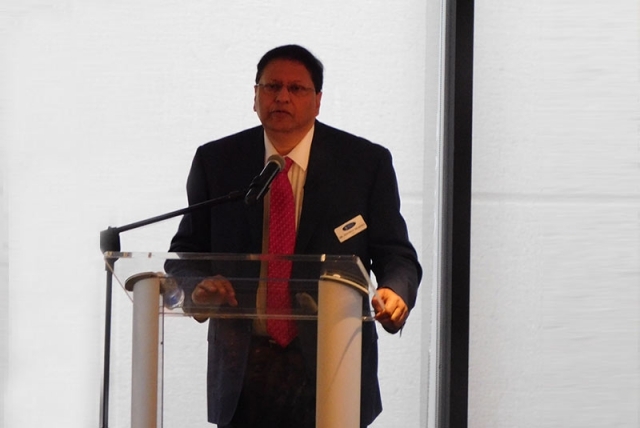 Sovereign Health’s CEO Dr. Tonmoy Sharma speaks on the panel at the 2nd Annual C-Suite 1-Day Symposium. From left to right: Josie Herndon, Dr. Tonmoy Sharma, Renee Popovits, J.D., Dave Sheridan and Joan Borsten. Not pictured: Harry Nelson, Esq. On Friday, September 1, 2017, Dr. Sharma was a panel member at the 2nd Annual Executive C-Suite 1-Day Symposium hosted by RecoveryView.com, an Online Journal: Insurance and leadership strategies for Behavioral Healthcare and Substance Abuse Treatment, at the Mission Inn Hotel & Spa in Riverside, California. As a panelist, Dr. Sharma was joined by other prominent members in the mental health and addiction treatment community, including Josie Herndon, Conference Host and CEO of Addiction Therapeutic Services and Recoveryview.com, Renee Popovits, J.D., Principle Attorney who founded the law firm Popovits Law Group, Dave Sheridan, Charter Board Member and President of the National Alliance for Recovery Residences (NARR) who served for a decade on the board of Southern California’s Sober Living Network, Joan Borsten, co-founder and past CEO of Malibu Beach Recovery Center, and Harry Nelson, J.D., founder and managing partner of Nelson Hardiman. Dr. Sharma spoke about the importance of treating mental health issues in patients with substance use disorders and for behavioral health organizations to use measurement-based care. He was joined by CEOs, Executive and Clinical Directors, and other professionals in the behavioral health industry who were interested in learning more about the future of behavioral healthcare and substance treatment services and for leaders in the industry to share information with each other and strategize solutions round the ever-changing healthcare economy system. Other attendees included Pete Nielsen, CEO of the California Consortium of Addiction Programs and Professionals (CCAPP), Cigna’s Medical Director Stuart L. Lustig, M.D., M.P.H., Stampp Corbin, M.B.A., the president of the Addiction Treatment Advocacy Coalition (ATAC), Rebecca J. Flood, CEO of New Directions for Women, and others. The 8th Annual West Coast Symposium on Addictive Disorders (WCSAD) was held from June 1-4, 2017, at the La Quinta Resort & Club in La Quinta, California. WCSAD was hosted by C4 Recovery Solutions. The four-day event included skill-building workshops, opportunities for networking and presentations from renowned speakers, thought leaders, best-selling authors and leading experts in the behavioral health industry who focused on topics related to legal and ethical issues, addiction, neuroscience, co-occurring disorders, mindfulness, trauma, process addictions and more. On the evening of Thursday, June 1, Sovereign Health hosted a facility tour of its Palm Desert facility, followed by dinner at the Sovereign Health restaurant in Rancho Mirage. More than 80 guests attended the event. On June 2, 2017, Sovereign Health hosted the Friday Luncheon. During the luncheon, Dr. Sharma introduced Veena Kumari, Ph.D. Dr. Sharma presented on, “The State of Addiction Treatment,” which focused on the transition from volume to value-based care and the increased need for behavioral healthcare providers to begin utilizing measurement-based care. He spoke passionately about the need for providers to hold themselves accountable for the treatment they provide to their patients and to continuously monitor how patients with mental health and substance use disorders are improving (or not) throughout the course of treatment. Calling for a paradigm shift in the view and treatment of mental illness and addiction, Dr. Sharma urged the entire industry to adopt a standardized set of measures to improve the assessment, monitoring and treatment outcomes of patients with mental health and substance use disorders. “We are treating addiction like we treat infection … as if it’s an acute condition, rather than a chronic, relapsing and unremitting illness,” said Dr. Sharma. “Rather than treating [addiction] with episodic care as if it’s an infection, we should be treating addiction the same way that we treat asthma, diabetes, hypertension and other chronic illnesses,” he said, emphasizing the need for providing patients with a full continuum of care rather than episodic treatment. A record-breaking 1,307 attendees attended the symposium. On Tuesday, May 16, 2017, from 12:00 to 1:30 p.m. ET, Dr. Sharma presented at The Telehealth Capital Connection, a bi-monthly briefing held at the Top of the Banquet & Conference Center in Washington, D.C. Dr. Sharma’s presentation, “Behavioral Health in U.S. Children and Adolescents: A National Crisis,” was delivered at the Telehealth and the ABCs of Keeping Kids Covered briefing of the American Telemedicine Association (ATA), which focused on behavioral health conditions in children and adolescents and how telemedicine can be used to improve the delivery of health care to better serve young people. Dr. Tonmoy Sharma (center) with two of Sovereign Health’s Business Development Representatives, Kate Billota (left) and Lindsey Corcoran (right). As a thought leadership partner of the event, Sovereign Health was represented at the Institute for the Advancement of Behavioral Healthcare’s 2017 Chicago Summit for Clinical Excellence, called, “Freud Meets Buddha: Mindfulness, Trauma and Process Addiction,” by CEO Dr. Tonmoy Sharma. His presentation, “Using Measurement-Based Care to Enhance Substance Abuse & Mental Health Treatment,” was held on Friday, March 10, 2017. Other featured speakers at the event included Gabor Maté, M.D., Harriet Lerner, Ph.D., Reef Karim, D.O. and Robert Weiss, LCSW, CSAT-S.
“Clinicians can use a number of validated tools and scales to measure patients’ outcomes and improve clinical efficacy in their practices,” said Dr. Sharma. During his presentation, he discussed the use of quantifiable measures to help clinicians assess patients’ clinical outcomes and progress to determine whether treatment is working or not, so treatment can be adjusted accordingly to improve their efficacy of care. The Institute for the Advancement of Behavioral Healthcare’s 10th Annual Chicago Summit for Clinical Excellence brought together private practice therapists, counselors, psychologists, addiction professionals, social workers and psychotherapists for a four-day regional conference from March 8-11, 2017, in Chicago, IL. The four-day event included skill-building workshops, networking opportunities and presentations from renowned speakers, thought leaders, leading experts and best-selling authors who covered issues faced by clinicians in the behavioral health industry, including topics related to legal and ethical issues, addiction, co-occurring disorders, neuroscience, mindfulness, trauma and process addictions. Dr. Sharma was invited to speak at the “Accreditation Workshop,” alongside The Joint Commission, on Thursday, Feb. 9, 2017. The Live Event was held at the Scottsdale Resort at McCormick Ranch in Scottsdale, AZ, and covered the steps organizations can take to become Joint Commission accredited, basic requirements for accreditation, and the types of resources available for assistance. As a guest speaker, Dr. Sharma’s presentation was in two parts: “Using Measurement-Based Care to Enhance Substance Abuse and Mental Health Treatment,” and “How to Build a Company into a National Brand (see video).” As a proponent of using measurement-based care (MBC) to improve treatment outcomes, Dr. Sharma spoke about how his organization has implemented a system of MBC to improve patients’ treatment outcomes as well as the delivery of care to patients with mental health and substance use disorders. And he’s done more than just talk about it: Dr. Sharma has also been an early adapter by deploying MBC at Sovereign Health’s treatment facilities. During his presentation, Dr. Sharma reviewed the empirical support for the use of measurement-based care (MBC) and how it can be successfully implemented in clinical settings. The presentation highlighted the benefits of using MBC for improving the delivery of mental health and addiction treatment and providing insight into patients’ treatment progress. As a featured speaker, Dr. Sharma was joined by Robert Ackerman, Ph.D., Mark S. Gold, M.D., Alexandra Katehakis, Ph.D., M.F.T., David Mee-Lee, M.D., Marc F. Kern, Ph.D., and other prominent healthcare professionals working in the addiction and mental health fields. -DR. TONMOY SHARMAFrom 2:00-3:30 pm, Dr. Sharma also held a workshop on, “Cognitive Rehabilitation as a Crucial Tool in Increasing the Effectiveness of Treatment in Substance Abuse Disorders,” which examined the cognitive impairments in individuals seeking treatment for substance use disorders and how they can impede treatment goals and progress. The workshop demonstrated how treatment centers can utilize cognitive assessments to assess patients’ cognitive function and how cognitive remediation can be utilized to restore brain function. The 2016 State of Recovery Conference: On Thursday, July 21, 2016, from 1:30-2:30 pm, Dr. Sharma presented at the State of Recovery Conference at the Diplomat Resort and Spa in Hollywood, Florida. During his presentation, called, “Improving Outcomes Increasing Value through Institutional Development,” Dr. Sharma guided attendees on how to identify systems and processes necessary to build and expand their practices, treatment facilities and behavioral health systems, and how to create a sustainable infrastructure. Dr. Sharma defined the challenges of operating a residential behavioral health organization in the current health care climate and provide an overview of how these challenges have traditionally been met. On Tuesday, May 31, 2016, Dr. Sharma presented on, “Un-frying your Brain—Reversing the Cognitive Deficits in Substance Abuse,“ at a continuing education luncheon, at the Center Club in Costa Mesa, California, from 11:30 am to 1:30 pm. His talk focused on the application of cognitive remediation as a valuable tool to reverse cognitive deficits caused by harmful substance and mental illnesses as well as the benefits of certain treatments, including cognitive remediation, for reversing such deficits. Dr. Sharma also looked at how alcohol and illicit drugs affect the pathogenesis of disease severity.